I have had this book on my “to-read” shelf since the summer. I know this because I bought it one night during one of those stroll around the city since it’s still light at 10pm kind of dates (and can I just say, thank goodness it’s almost March, which means the one good thing Bush Jr did in eight years – adding four weeks to DST – is about to be upon us again). I’m pretty sure the cover of this book sold it to me (look at the piece of cake and tell me you don’t want to throw down your resolve and grab a fork). The way I buy books when I’m in a physical bookstore (not at all online, oddly enough), is that I browse around, and when a cover catches my eye, I read the first few pages or even the whole first chapter, depending on how intrigued I am; I decide from those two factors whether there is any chance I’ll ever want to read the book in full, then buy it or return it to the shelf accordingly.It’s not a scientific system, and it has its flaws (mainly, that I buy a bunch of books that seem promising but then mock me from the bookshelf for months or even years afterward), but I keep doing it. And sometimes it pays off. 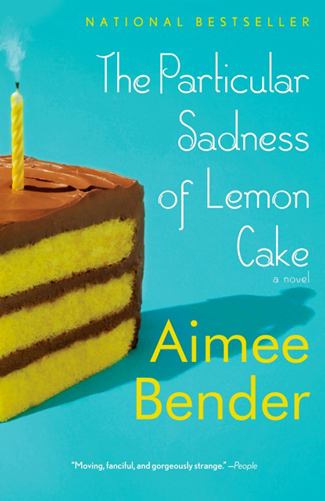 In the case of The Particular Sadness of Lemon Cake, it paid off in spades. It’s fiction. That also has a…I don’t supernatural? Science fiction? Hyper-vivid imagination? element to it that took me completely by surprise. It’s one of those books that I really don’t want to go into much detail about because one of the things I enjoyed most was how deftly Bender takes her concept and continuously massages new facets out of it for 300 pages. I thought I knew exactly what to expect – the back cover shares the premise of the book after all – that a nine-year old girl develops the ability to taste the emotion cooked into food – but the story balloons into so much more while remaining intimate, painful, and even a smidge redemptive. Maybe it’s the fact that I spent twenty or so years of my life with undiagnosed lactose intolerance that I found this book so easy to sink into. This is a dance between girl and food and things incomprehensible, and there is no escape because everyone has to eat. For some people, food is a constant pleasure, an easy, understandable three meals a day; for others, it’s a base necessity lacking mystery beyond existing or not; but for some of us unfortunate folk, it is work, constant work for the body and the mind to come to an agreement about nourishing the physical existence and the soul. So is it in your luggage? I came across this book at the Mountain View bookmobile, and the cover also drew my attention (just like anything related to cake would). I read the back cover, flipped through the pages – it sounded interesting. But I was already picking up another book and thought that I’d check this one out later. Now that I read your post, I’m definitely going to get it. I’d be happy to lend it to you when I get back into town!